The first season of AMC’s Preacher took a decidedly different turn from the comics it was based on. It was essential a prequel, leading up to the events of the first issue, setting the tone and introducing the characters in a uniquely manic and violent world. It was a big risk. Now that season two is about to premiere this Sunday, the people behind the show are hoping the risk will pay off. 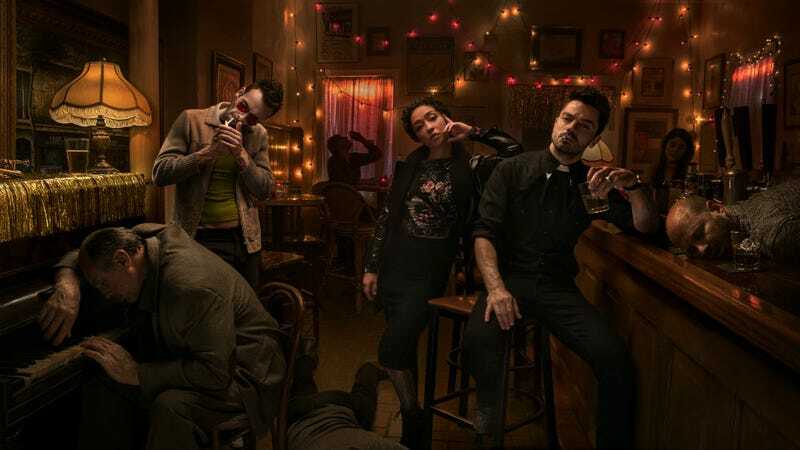 That patience allowed for Preacher to set up what’s to come—namely, the titular preacher named Jesse (Dominic Cooper), who has been possessed by a superhuman power that makes people follow his commands, traveling across America with his badass girlfriend Tulip (Ruth Negga) and vampire pal Cassidy (Joe Gilgun) to find God... but not in a spiritual sense. They’re literally going to hunt for God, who is missing from Heaven but is currently on Earth. Despite the drug analogy, it was still a measured approach to adapting the beloved comic series, and it certainly drew some critics. The show’s pacing and focus on non-main characters was regularly questioned. Plus, the show didn’t get the kind of buzz or ratings of AMC’s comparable genre shows like Breaking Bad and The Walking Dead, making a mystery of whether the show would even get a second season. Negga and Cooper in the season two premiere. To that end, season two is a complete departure from the first season, especially since the rural setting of the first season was literally blown away in the season one finale. The show will now more closely follow the comics as the main characters go on the road. The villains will be Herr Starr and the Saint of Killers, just as in the comics, and yet, “It’s still fantastically different from the comic,” said producer Evan Goldberg. Goldberg and his producing/director partner Seth Rogen feel the same way. The executive producers once again direct the first two episodes of this season and will continue to lend their Preacher expertise throughout. They have no regrets with the choices they made for season one, and look forward to seeing what’s still to come. This didn’t only help establish the show and its characters—it helped Catlin, too. Although he’d been a writer/producer on Breaking Bad, he’d never done anything remotely as weird as Preacher before. Out of everyone, he learned the most while working on season one. The vampire Cassidy is the conduit for much of Preacher’s madness. Mere minutes into the second season, audiences will see that’s the case. The premiere begins with one of the biggest, grossest, craziest action scenes we’ve ever seen on TV, and it feels like the show is going to stay that crazy throughout the season. Now the question is, since that Preacher has started to line up more with the comic fans know and love, will a larger audience tune in? Preacher season two begins this Sunday, June 25, with a two-night premiere; the second episode airs on Monday, June 26, in its new regular time slot. Why Are So Few People Talking About the Preacher TV Series?